memory box gift small teddy bear . 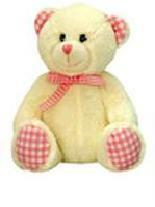 Huggable snuggle and pleasant to the touch a soft teddy bear that's not to overpowering in size. Sitting next to baby what a precious gift of love, a so precious memory box gift from you.This teddy bear measures 15cm sitting position andwill keep baby company forever asleep or kept as a wonderful baby keepsake item treasured forever.stunning quality by Keel toys. click the order button just below to purchase this special gift.